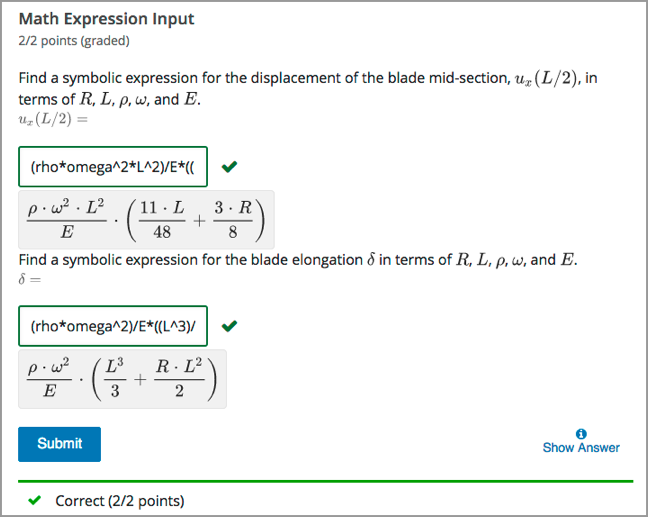 The math expression input problem type is a core problem type that can be added to any course. At a minimum, math expression problems include a question or prompt and a response field for a numeric answer. You can make a calculator tool available to your learners on every unit page. For more information, see Calculator Tool. When you create a math expression input problem in Studio, you use MathJax to format text strings into “beautiful math.” For more information about how to use MathJax in Studio, see Using MathJax for Mathematics. In the LMS, learners enter a value into a response field to complete a math expression input problem. The following example shows a completed math expression input problem that contains two questions. The open learning XML (OLX) markup for this example math expression input problem follows. You add math expression input problems in Studio by selecting the Problem component type and then using the advanced editor to specify the prompt and the acceptable answer or answers. From the list of Advanced problem types, select Math Expression Input. Studio adds a template for the problem to the unit. Select Edit. The advanced editor opens the template and shows the OLX markup that you can use for this problem type. Replace the guidance provided by the template to add your own text. For example, replace the question or prompt, answer options, and solution. Update the OLX to use any additional elements and attributes in your problem. The following template includes a Python script. When you add a script to a problem component, do not add to or change its internal indentation. A “jailed code” error message appears when you save the problem in Studio if the <script> element is indented. This template includes a placeholder value for the samples attribute of samples="R_1,R_2,R_3@1,2,3:3,4,5#10". You enter values for this attribute in the following format: samples="VARIABLES@LOWER_BOUNDS:UPPER_BOUNDS#NUMBER_OF_SAMPLES". Additional detail follows in the description of the <formularesponse> element. For math expression input problems, the <problem> element can include this hierarchy of child elements. Required. Indicates that the problem is a math expression input problem. The <formularesponse> tag is similar to the <numericalresponse> tag used by numerical input problem types, but <formularesponse> allows unknown variables. type Can be "cs" for case sensitive, which is the default, or "ci" for case insensitive, so that capitalization does not matter in variable names. The correct answer to the problem, given as a mathematical expression. If you precede a variable name in the problem with a dollar sign ($), you can include a script in the problem that computes the expression in terms of that variable. Specifies important information about the problem in the following lists. Commas separate items inside each of the four individual lists. The at sign (@), colon (:), and hash tag (#) characters separate the lists. An example of the format follows. For example, a <formularesponse> element that includes the samples attribute might look like either of the following. Required. Creates a response field in the LMS where learners enter a response. Learners also see a second field below the response field that displays a typeset version of the entered response. The parser that renders a learner’s plain text into typeset math is the same parser that evaluates the response for grading. size Optional. Defines the width, in characters, of the response field in the LMS. type "tolerance" defines a tolerance for a number. default Required. A number or a percentage specifying how close the learner and grader expressions must be. If you do not include a tolerance, the expression is vulnerable to rounding errors during sampling. The result of such unavoidable errors is that the grader can mark some learner input as incorrect, even if it is algebraically equivalent. Optional. Specifies a script that the grader uses to evaluate a learner’s response. A problem behaves as if all of the code in all of the script elements were in a single script element. Specifically, any variables that are used in multiple <script> elements share a namespace and can be overridden. As with all Python code, indentation matters, even though the code is embedded in XML. type Required. Must be set to loncapa/python.